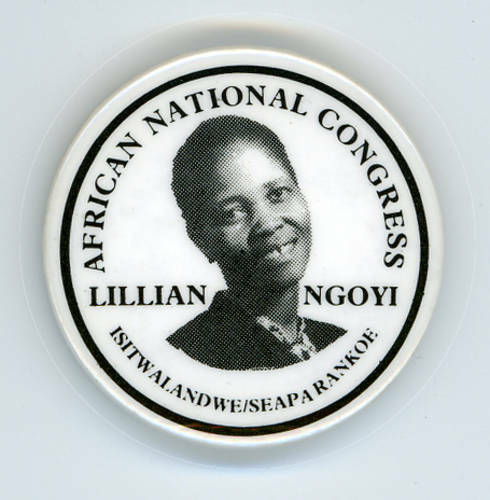 Lillian Ngoyi was born in Pretoria in 1911. She was employed in a clothing factory from 1945 to 1956. At this time she joined the Garment Workers Union, and was elected to the Executive. In 1952 she joined the African National Congress (ANC) during the Defiance Campaign and was arrested at a post office that was reserved for white people. A year later she was elected to the ANC National Executive and to the position of President of the Women's League. In 1954 she helped launch the Federation of South African Women was elected Vice-President and in 1956 President. On August 9, 1956 she led, with Helen Josephs, the women's anti-pass march on Union Buildings in Pretoria. In December 1956 she was arrested for high treason with 156 others, and stood trial until 1961 as one of the accused in the four-year Treason Trial. While out on bail during the Treason Trial she was imprisoned for five months during the 1960 State of Emergency. In 1962 she was issued the first in a series of bannings order in 1962 that confined her to the Orlando Township outside Johannesburg and was prohibited from attending or addressing gatherings. In the mid-1960s she was jailed under the 90-day detention act and spent 71 days in solitary confinement. Her banning orders lapsed in 1972 but were renewed for fives years in 1975. She died in March 1980. In 1982 she was awarded sitwalandwe/Seaparankwe, the African National Congress's highest honor awarded to those who have made an outstanding contribution and sacrifice to the liberation struggle. (Sources: "Lillian Ngoyi: Isitwalandwe" by Hilda Bernstein Sechaba, August 8, 1982 and sahistory.org.) This button has no date but is believed to have been produced in 1982 in Zambia.